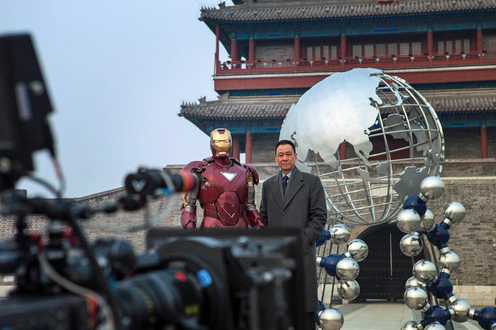 Production for Marvel’s Iron Man 3 was underway earlier this week in China. To publicize the moment, a photo was taken of Iron Man and actor Wang Xueqi, who plays Dr. Wu in the movie. It’s a bit odd seeing the armor that took a beating from Thor and the Helicarrier, since Tony Stark is all about constant progression. But who knows? Aside from anyone involved in the film, of course. Marvel is working in partnership with DMG Entertainment on locations in China. Have I ever mentioned how excited I am for Iron Man 3? Oh, right, every single time I’ve mentioned the film. I can’t wait!